Developer Bin4ry strikes again! His modified Samsung Gear 360 Manager app runs on non-Samsung phones. Moreover, it one-ups the Gear 360 Manager by adding full 4k support for other phones! 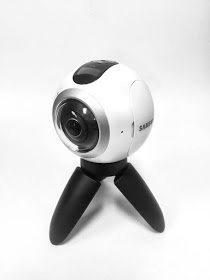 The Samsung Gear 360 is the most affordable fully spherical 4k camera right now, but it can only connect to the latest flagship Samsung phones (S6 and above). Another limitation is that even if the video is captured in 4k, it has to be stitched, and if you stitch it on a phone other than the S7 (or S7 edge), the stitched video will be limited to 2k. Bin4ry created a modified version of the Gear 360 Manager app that solves both of these problems. First, it runs on non-compatible phones, including a Sony Xperia Z5. The app has all the functions of the original, including remote shutter and stitching photos and videos. In addition, Bin4ry’s modified Gear 360 Manager allows non-S7 phones to stitch the video in 4k resolution! The app requires Samsung Accessory Service to work. And if you have a phone that is natively compatible with the Gear 360, such as the Galaxy S6, you will be blocked from installing Samsung Accessory Service! So, I unfortunately haven’t been able to install Bin4ry’s modded Manager app. Bin4ry was very kind enough to walk me through the installation on an S6. On an S6 (with Marshmallow), you don’t need Samsung Accessory Service. I had to uninstall the original Samsung app. Then I downloaded the version that’s been posted on Google Drive (the other version had a parsing error). At first I was blocked from running the app. I clicked on settings and allow an app to run from unknown source. The app installed as normal. The app works just like the original. However, if I try to stitch a 4k video, the app crashes after exactly 29% regardless of how long the 4k video is. I will try to work with Bin4ry to see if this can be fixed. For more info and to download, please click on this thread on XDA Developers forum! Also please consider supporting Bin4ry’s development efforts. – use an iPhone to trigger the Gear 360 remotely. – trigger the Gear 360 remotely with the dedicated Bluetooth shutter. Samsung Gear 360 Waterproof Case Update PLUS New Accessories!! !